A few months ago, Sonja Moehle knew almost nothing about the various subspecies of elk in Michigan. Nor about the endless, dusty drawers of meticulously labeled prehistoric bones at the University of Michigan’s Natural History Museum. Nor how to retrieve an animal skeleton from lake muck to help determine how the animal died. Now she knows quite a bit about all those subjects, and much more. She has a team of expert advisers in Ann Arbor and around the country, and her family has become her research and support team. The family’s basement has become her laboratory, and a community of online friends and anonymous donors have become her funders. 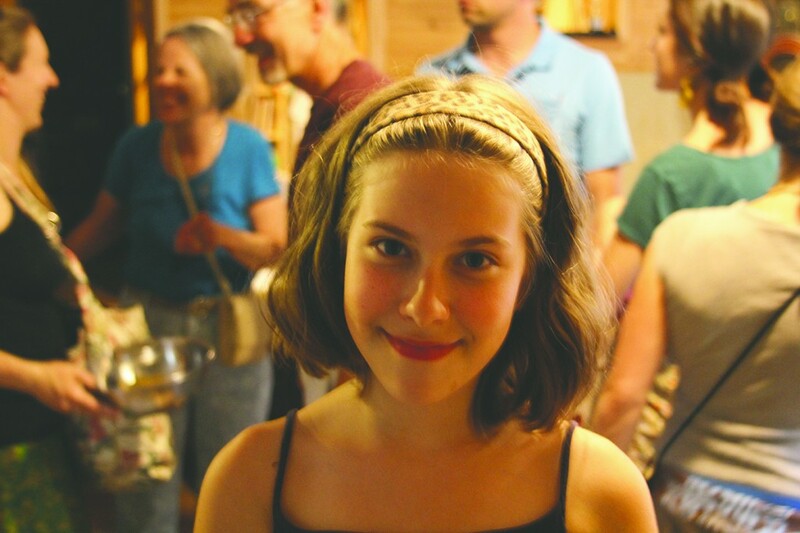 It seems more likely that Sonja — known as “Sunny,” probably for her wit and ever-cheerful disposition — is a graduate student working on a thesis project than a 10-year-old homeschooler in the middle of Benzie County. Now the whole family is helping Sunny to answer dozens of new questions. Not the least of which is: what exactly did she find in the lake this past Easter? “Dad called Mom and said, ‘We found dinosaur bones!’” Sunny recalls with a smile. She is sitting in the family’s living room, which also serves as an office. The office wall expands and contracts as needed — expanding to take up living room space when work needs to be done, contracting when work seems claustrophobic, or when guests are coming over, or maybe just because — similar to an accordion-like room divider in a Victorian-era painting. 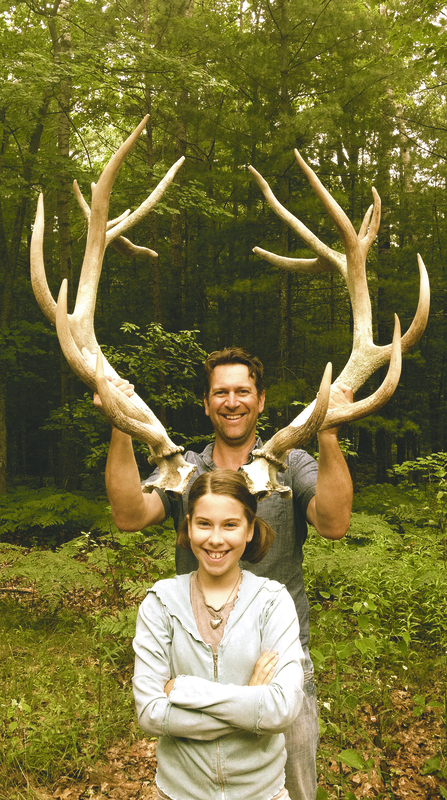 Sonja and David Moehle show the scale of their mysterious antlers. Photo courtesy of Amy Daniels Moehle. Her mother, Amy, sits across the room and adds that she had been patiently watching the Easter roast beast get drier and drier as she waited for her husband and youngest daughter to get home from an early spring paddle on a favorite lake, while the older daughter, Nadia, was nursing a cold and watching a film. Behind Amy, the room’s walls are not covered in the flowery, repeating designs of typical wallpaper. Instead there are quotes, drawings, caricatures, and other written works sketched about by family members. There are hundreds of books on shelves that jut out from the wall drawings, and they range from a two-foot-tall monster volume of DaVinci to an entire shelf on mythology, with some popular fantasy books speckled in there, as well. The mismatching chairs and couches that the family sit on only look mismatched in appearance, as they have intention in common; the intention of comfort. A rocker to lull a child to sleep, a window seat to contemplate, a couch to share the awkwardness, or the familiarity, or just the comfort of being close to another person. It is this flexibility and focusing of intentions that Amy and her husband, David, hope to instill in their children. “We carefully curate our children’s interest with a little caution. Just giving an answer can close a door,” Amy says. Thus, when Sunny and David were two hours late from paddling on a lake that was still partially covered in ice, she reserved judgement. You see, being two hours late in the Moehle household is not the same as being two hours late in most homes. For the Moehles, being two hours late can sometimes be considered earning extra credit. When you are homeschooled or you are in charge of the homeschooling, daily activities can turn into a learning opportunities and unexpected schoolwork. “Legend says that the lake is haunted by a whole team of horses that were pulling timber, and they fell through the ice,” Sunny says, adding that pristine logs can still be seen along the bottom in parts of the lake. While paddling with her father, Sunny spotted something out of place — and it wasn’t just a log. She thought it might be a horse bone from one of the ghost horses. This is where most parents would say, “It is just a stick, leave it alone. We’re late for dinner.” A perfectly logical answer that would have closed the door on a potentially amazing discovery. David readily admits that he was pretty sure it was just another stick in the muck. But the Moehle family is not your average family, so David conceded, and a moment later he had hooked into something in the muck with his fishing pole. It was not a stick. Rather, it was a vertebrae. A very large vertebrae. David, an avid hunter, knew that this was too large to belong to a white-tailed deer, and now he was intrigued. Was it, in fact, a horse bone? Since David’s fishing pole wouldn’t be able to pull up a bigger bone from the bottom, they returned to shore, grabbed a gaff hook (for hauling in big fish), and soon pulled up a perplexingly large antler. And then another one to make a matching set. The antlers spanned four feet each, with nine points on one side and eight points on the other side. This was no horse. After some (dry) roast beast and a flurry of research, the family figured out that what they had found were likely elk antlers. However, the size and scope seemed to rule out the reintroduced Rocky Mountain elk that are now present in Michigan. So what type of elk was this? Was it the now extinct Eastern elk, which was last seen in the 1800s? Or was it a prehistoric elk, present during the time of the mastodons? Or something entirely different? Since “the experts” would surely have all the answers they were seeking, the family packed up the car a few weeks later and headed down to Ann Arbor to meet with PhDs at the University of Michigan. Despite a dizzyingly fun and educational VIP tour behind the after-hours closed doors of the university’s Natural History Museum, the Moehles ended up with more questions than answers. What type of elk is it? The experts said they were unsure, but DNA testing could help determine the species. How old are the bones? Again they are not sure, but radiocarbon dating could narrow it down. How did the animal die? They can’t be certain, but they suggested that the family could retrieve the rest of the bones themselves — in a scientific manner, of course — and then the experts could help the family to figure it out. Or, they suggested, the Moehles could donate the bones to researchers and perhaps never see them again. The lack of answers from the experts was a surprise “We thought there was just one right answer,” says Nadia, the oldest daughter. Would they donate the bones or devote hundreds of hours collecting, recording, studying, researching, radiocarbon dating, and DNA testing these bones? It was an easy decision for the Moehles. Radiocarbon dating and DNA testing is costly. The Moehle’s have started a Kickstarter campaign to cover the costs of the testing and travel (Sonja’s projected total budget: $5,689.25). To donate, visit their online Kickstarter page http://goo.gl/iZ9eri or check http://www.sunnyandtheelk.org for further updates and other funding options. What a Great teaching moment, and precisely how a home teacher should handle it. NICE FIND! I work at Mt. Locust on the Natchez Trace Parkway and have always been fascinated by the intriguing history of that old trail as it was first forged by wild bison and Eastern elk herds centuries ago. Sadly, they were both extirpated from the Eastern United States by the Europeans in the 19th century. What a magnificent national treasure Ms. Sonja “Sunny” Moehl has indeed found. Previously, only the painting of the Eastern elks by John James Audubon, was all that was left of them. Better yet, how generous of her to share this find with both the scientific community and the world! Kudos to she and her family! Cannot wait for this story to continue to unfold and one day hope to meet dear Ms. Moehl and see the magnificent Eastern Elk in which she discovered or what else in the future she may “float” upon!